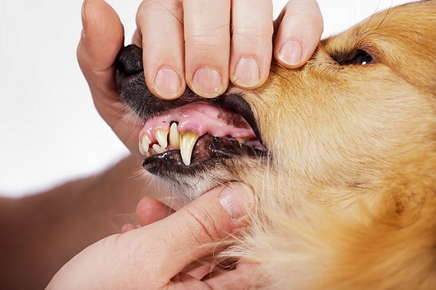 Over 85% of dogs and cats have some type of periodontal disease. Periodontal disease simply means that the gums and bone that hold the teeth in place are being destroyed by oral bacteria. This preventable disease is the number one diagnosed disease in our pets, yet many animals suffer needlessly. Periodontal disease begins with gingivitis, or inflammation of the gum tissue, which is caused by plaque. Plaque is a mixture of saliva, bacteria, glycoproteins and sugars that adhere to the tooth surface. Within minutes after a cleaning, a thin layer of plaque has adhered to the teeth. Eventually this hardens to become calculus or tartar. Calculus by itself is nonpathogenic - it does not cause disease. However, it does create a rough surface for more plaque to adhere to, and pushes the gums away from the teeth, which increases surface area for more plaque to adhere. Eventually, the supporting structures of the tooth (bone, tissue, periodontal ligament) are destroyed and the tooth becomes mobile and will either fall out on its own or need to be extracted. Signs of periodontal disease are bad breath (halitosis), reluctancy to eat, chewing on one side of the mouth, dropping food, pawing at the face or rubbing the face on the floor, drooling, becoming head shy, and painful mouth/face. Periodontal disease and oral bacteria can easily affect other organ systems including the heart, liver, kidneys, lungs and brain. Make sure you bring your pet into the office for regular vet cleanings. Contact us if it's time for your pet's next cleaning.